Hello friends! I’m finally back! I wanted to kick off the year with some design inspiration that I’ve been eyeing lately. 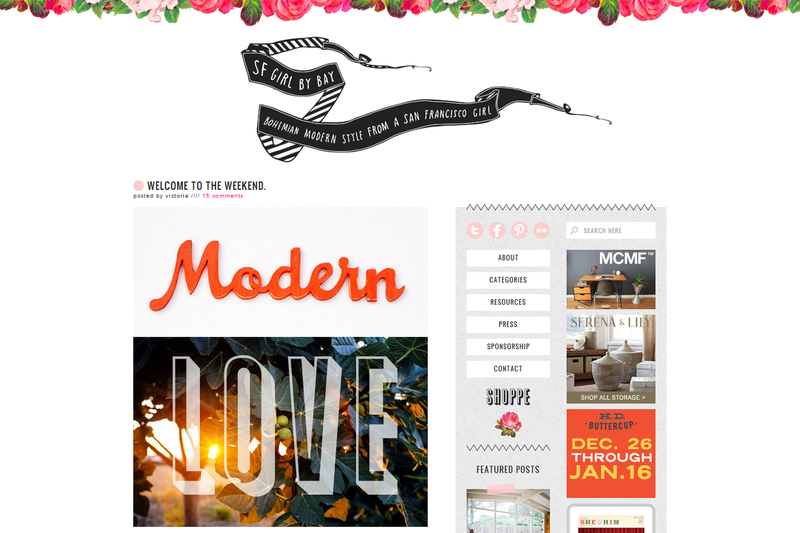 The blog design I am featuring this week is SF Girl By Bay. Her blog design is by Anna Dorfman, and the header graphic is by Shanna Murray. This blog isn’t exactly a secret, but today I wanted to highlight two specific things that I love about this design. The first thing that I think is really interesting is the pattern, or lack thereof. The only background pattern used for the main part of the blog is at the very tippy top of the page, that awesome floral graphic. This frees up the rest of the blog to be totally white, allowing the eye to focus on the content. I love that! I will post a blog design I did later this week draws inspiration from that concept. The second thing that I think is awesome about this design is how the sidebar and footer are given their own background pattern (that looks like newsprint!) and they overlap to create a really dynamic footer. Click on the blog and scroll all the way down to the bottom. Isn’t that great? I always struggle with the footer. It often gets put on the back burner. I would really like to come up with some ideas on how to make that space more useful, or at least more interesting and helpful to the overall design. I’m so glad to be back and I’m excited for a busy and productive 2012! As always, thanks for reading and I look forward to a new year of getting to know you all better! I love the design of SF Girl by Bay for the same reasons! There are just enough design elements to make the blog feel unique without overpowering the content. I had never really looked at the footer before — it’s great!